Vineria t.v.b is an Italian restaurant located within walking distance of the bustling Shijo Kawaramachi district in Kyoto. The name of this restaurant is based off of a word created by the casual Italian restaurant Trattoria from the word Vino, meaning wine. Vineria t.v.b is an expression defining a casual space where you can enjoy Italian cuisine paired with wine in a stylish atmosphere. It is alluringly chic and high-class. The dishes are centered on meat and vegetables sourced locally in Kyoto. The simple flavors bring out the taste of each ingredient and add a new layer to the flavor of Italian cuisine, bringing you a taste that you will want to come back for day after day! Counter seats are available for the enjoyment of individuals as well as couples, while tables are also available for families and larger groups of friends. In addition, from May to September there is an outdoor seating area called “Yuka” which allows you to gaze at the Kamo River as you dine. The Yuka seating area is perfect for every occasion. Most dishes are a la carte, allowing you to order your favorite items. Pairing excellently with wine, this is one of the first items you should try. The flavor of the fresh tomatoes with the perfect balance of sweet and tart flavors is outstanding with the mozzarella cheese. Their use of basil, black pepper, and olive oil is completely satisfying. This dish uses chicken from Kyoto baked in the oven with seasonal vegetables. The chicken is juicy and tender and paired with fragrant herbs and olives. The size is perfect to serve a party of two. Please be aware that this dish takes approximately 30 minutes to prepare. Pasta that is wonderfully simple, using tomatoes, basil, and cheese. The simplicity allows the flavors of the ingredients to truly stand out, and adds to the cheesy texture. The tart of the tomatoes goes well with the cheese, providing a full-bodied taste and smell that with envelop your senses. It is a simple dish, yet one that you will long remember. This dish will be brought out split up into individual servings. This juicy sausage is packed with savory meat. One bite and the juices will fill up your mouth with flavor. The taste is accented with fragrant pepper and herbs as well. The piping-hot potatoes are delicious and go well with a healthy helping of mustard. 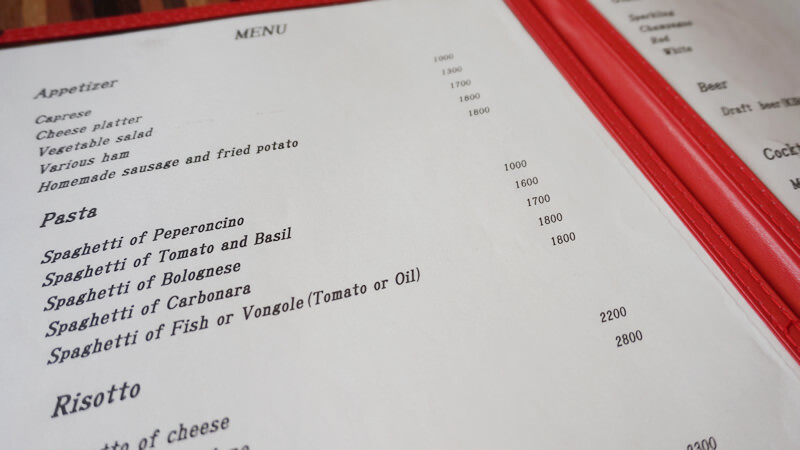 The restaurant provides a menu entirely in English. The contents of this menu differ slightly from the Japanese menu, and the menu is streamlined to list the items preferred by customers visiting Japan. The prices listed are also slightly different due to the increased portion sizes preferred by guests visiting Japan. • Please tell the staff if you wish to see the Japanese menu or have staff explain any of the menu items. The English-speaking staff will be happy to help you. • There is also a menu with items that can only be ordered after 12:00 a.m. Items include fried chef’s specialties as well as curry rice. Please try these items if they interest you. The dishes at Vineria t.v.b are comparatively light, yet possess a savory mouthfeel thanks to an outstanding attention to seasoning. The chefs take great care in preparing dishes with a perfect balance of salt, pepper, olives, basil, and herbs to bring out the maximum flavor of each ingredient. There are many Italian restaurants in Kyoto, but Vineria t.v.b has the winning combination of an outstanding atmosphere, convenient location, and delicious food! Vineria t.v.b is a well-known Italian restaurant that serves seasonally prepared food in a casual dining setting. The entrance to the restaurant feels a little imposing when you first walk in, but the atmosphere inside is actually very casual and easygoing despite the upscale setting, which means you can eat here without feeling awkward even if you come in by yourself . Vineria t.v.b is great for a variety of dining occasions, and they also offer an extensive selection of wines to pair with each dish. So even if you have already traveled to Kyoto, I'm certain that Vineria t.v.b will offer you some of the city's best Italian food. 2-minute walk from Keihan Line Gionshijo Stn. 4-minute walk from Hankyu Kawaramachi Stn. 5pm - 2am (L.O.1am) *The Yuka (床) area is open from 5:00 p.m. to 11:00 p.m. (with last order at 10:00 p.m.) Dining is available inside the restaurant after 11:00 p.m.
Sunday *However, operating times are irregular on long holidays as well as at the start and at the end of the year. The restaurant is crowded from 7:00 p.m. to 8:00 p.m. The seating charge for each person is 500 yen. The seating charge for the Yuka (床) area is 700 yen per person. They provide a menu with the items listed in English. In addition, they have English-speaking staff, allowing you to better relax and enjoy your meal.